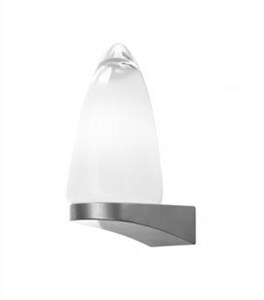 DESCRIPTION Leucos� first design in 1962, Gill is a wall or ceiling mount featuring a round, blown-glass diffuser in clear crystal with a circular white detail across the front. Also available in all white. General illumination is provided from an incandescent source. CONSTRUCTION The glass diffuser is held in place with three screws that secure it to the painted titanium backing. The backing mounts to a standard 4� octagonal junction box either on the wall or ceiling.